It’s time to look at a flu horror film. I don’t think I’ve seen too many of those. The last one would be Resident Evil I suppose. I guess Maggie would probably count as well. Of course, this film is going for a more realistic angle than those as we get corporate business trying to keep the cure for themselves and a lot of other conspiracies. Contagion is a bad film, but at least there are parts of it that are enjoyable so that’s still better than some of the competition. To put it one way, it’s a better film than Resident Evil, but the latter is more enjoyable. So, the film starts off with a bunch of people getting sick everywhere. They decide to infect the healthy people by coughing and sneezing everywhere. They’re successful and quickly the Earth starts to be overrun by the flu. The government doesn’t know what to do about it either so they decide to stay quiet. The problem is that an online blogger has figured out the issue and even the cure to it. People quickly turn into mobs to grab it all so now the world is in peril. Can this outbreak be contained or has it already spiraled out of control? Only time will tell. There are several plots in the film. Most of them are relatively separate, but they interconnect once in a while. The best plot is probably Mitch’s as he tries to keep his daughter safe from the outbreak. His son and wife were hit by it, but the daughter is safe so he aims to keep it that way. Unfortunately they are living next to the worst character in the film, a guy who likes the daughter. He keeps trying to infect her, but fortunately Mitch has his shotgun. He’s the only sensible character in the household so it looks like he is on his own. The daughter isn’t very smart of grateful either and she keeps trying to meet up with the neighbor, but fortunately Mitch is always ready. I don’t think this plot needed the extra tragic bit of his wife cheating on him though. I guess it’s to make the plot a little less sad in a way since now he knows why she died and how she made a fatal mistake, but it’s not like it really changed anything about the story. Another big plot is with an online blogger who claims to have found the cure. His name is Alan and he doesn’t particularly trust the government or any of the big pharmaceutical companies. He claims that they’re all working together against the everyday man and he’s not wrong. The problem is that when you make enemies out of powerful entities like this you’re always going to be in a world of hurt. He’s kidnapped and taken to their base where they threaten him quite a bit. He’s probably the best character in the film. You have to love the bravery he has and the guy definitely doesn’t back down so easily. He’s someone that you want in your corner. The final main plot is with the researchers who are trying to make the world a better place. They work on quarantining the place and stopping the virus. One of them ends up getting sick during the film, but it shouldn’t come as a surprise since she contacts everyone without a mask of gloves on. Considering how she explained that touching anything could make you sick, she really wasn’t smart about how she handled the situation. I can’t say that very many of the characters were all that smart though. One guy calls his wife to tell her to get out of the city, but rather than use his cell, he uses the company phone. Naturally this call is monitored and someone even overhears him. The Cell could have probably been tapped as well, but his odds would have most certainly been a lot better. What really hurts this film though is the senseless animal violence that occurs at various points of the film. We randomly see meat markets with a lot of animal violence and other moments throughout. These scenes come out of nowhere and don’t contribute anything. It’s just hear for the edgy factor and tears the film down. We also see someone get operated on which is fairly violent. Again, this scene comes out of nowhere. There’s quite a few scenes here that are just for shock value. Cut out these scenes and this would be a relatively tame film. I guess, they just didn’t want to go for that angle though. Bad move if you ask me. it’s an unfortunate truth that animals are always the first test subjects, but the film doesn’t need to go out of its way to remind us of that. One thing that is in the film’s favor is the soundtrack though. There are actually quite a lot of solid musical themes that play throughout the film. They really stand out and are quite memorable. Other thriller/horror films could certainly learn quite a bit from this one in that regard. Having good music always helps make a scene more engaging/interesting since you at least have something nice to listen too throughout. Now, the film does throw out a statistic that is sure to make you roll your eyes. The stat is that people touch their face thousands of times a day, 3-5 times a minute. We all know that this is hogwash and the test group used for the study must have caught Chickenpox or something beforehand. If you just think about it logically then it makes sense. When you’re watching a movie you aren’t touching your face like that. Likewise when eating or playing video games. Just take a look around outside and you can debunk this. When you’re trying to add drama to a film with a fake statistic you need to make sure it at least sounds realistic. Overall, Contagion definitely isn’t my kind of film. I don’t usually even care much for the cliche “main character gets sick” episode in most shows. It’s just not really a great plot and while a worldwide virus is certainly something to try out..it’s just not terribly interesting. The most enjoyable aspects of a film like that one are just seeing the government talk about it around a table. This film had some scenes like that and those were always a blast. Going to ground zero and actually seeing everyone get sick though? Yeah, that’s not really something that’s very exciting. I’d recommend skipping this film and just walking outside to see how everyone is always getting sick. Just be sure to keep a mask on or to walk briskly so that you don’t get sick as well. That certainly wouldn’t be worth it. 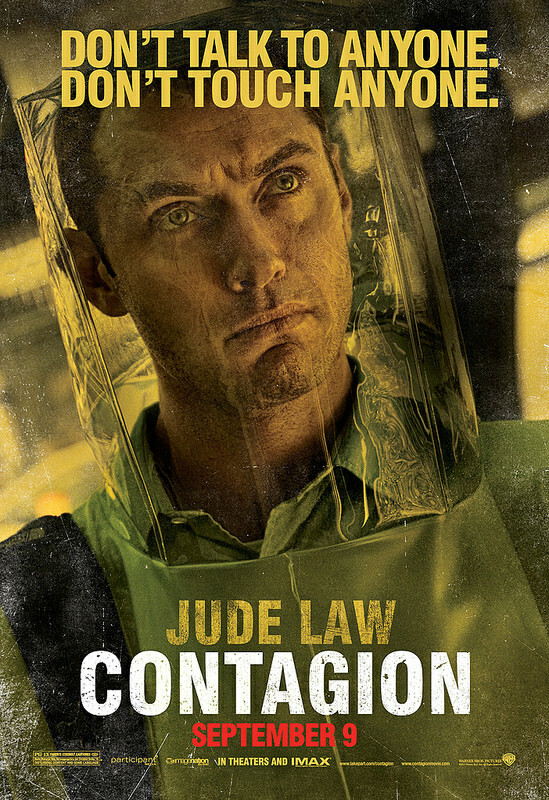 This entry was posted in Live Action Movie Reviews, Live Action Movies, Reviews and tagged Contagion, Disaster, Disease, Film Review, Flu, Horror, Matt Damon, Movie Review, Quarantine, Review, Thriller by dreager1. Bookmark the permalink.